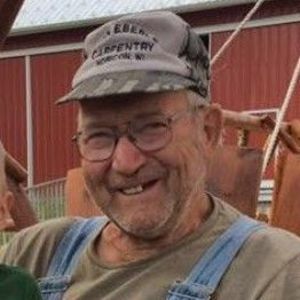 John F. Eberle, 81, of Horicon, passed away on Wednesday, April 10, 2019. John was born the son of Thomas and Angeline (Tresch) Eberle on November 16, 1937 in Madison. He was united in marriage with Evelyn B. Zimpelmann on June 18, 1960 in Whitewater. years. Eberle's Produce was well known throughout the community and beyond for John and Evelyn's handmade crafts and home-grown produce. Over the years, generations of families made annual trips to Horicon to see Grandpa John and pick the perfect pumpkin. Above all, John cherished his faith and his family; his wife of 59 years, their 5 children, many grandchildren and great grandchildren. He is lovingly remembered by his wife Evelyn, sons Ken (Margie) Eberle, Russ Eberle and Steve (Christine) Eberle, daughters Tina (Dave) Streblow, Janet (Brian) Schoenborn, sisters and brother; Elizabeth Kennedy, Larry (Ann) Eberle, Vicki (Gene) Coughlin, Shirley (Jack) Crouch, and JoAnn (Wayne) May, and his sister-in-law; Betty (Dave) Zastrow. He is further survived by other relatives and friends. He was preceded in death by his parents, 1 sister; Anna, and 1 brother-in-law; Bill. A Mass of Christian Burial will be held at 1:00 p.m. on Tuesday, April 16 at Sacred Heart Catholic Church, 950 Washington Street, Horicon, with Father Justin Lopina presiding, where John was a long time member, volunteer, and member of the parish council. Visitation will be held from 10:30 a.m until service time at the church. Burial will take place at St. Malachy's Catholic Cemetery in Horicon with military honors being conducted by the Horicon American Legion Post #157.